With the ambition to become an artist, Scott Naismith studied at Duncan of Jordanstone College of Art, Dundee. In June 2000 he left with a BDes in Illustration and printmaking. Since graduating Scott has been a full time artist, working from his studio in Glasgow. Much of his time is spent travelling around the country looking for inspiration for another depiction of the Scottish landscape. The many lochs, glens and isles of the West coast are amongst his favourite subject matter for his vibrant and atmospheric oils. Scott has been lecturing part time since 2004 and now lectures one day a week at the creative arts department of West College Scotland. Scott Naismith uses vivid colours in a vigorous application to represent the fast changing light conditions of the West coast of Scotland. Colour use often becomes an entirely emotional response to the subject while values can remain representational. The love he has for his native Scottish countryside is portayed in his work through an ebullient energy with which he handles the colour with palette knife and brush. Scotts recent work concentrates on transitional skies and the many colours involved when light breaks through cloud. These changing skies from dark to light are a metaphor for optimism and hope. 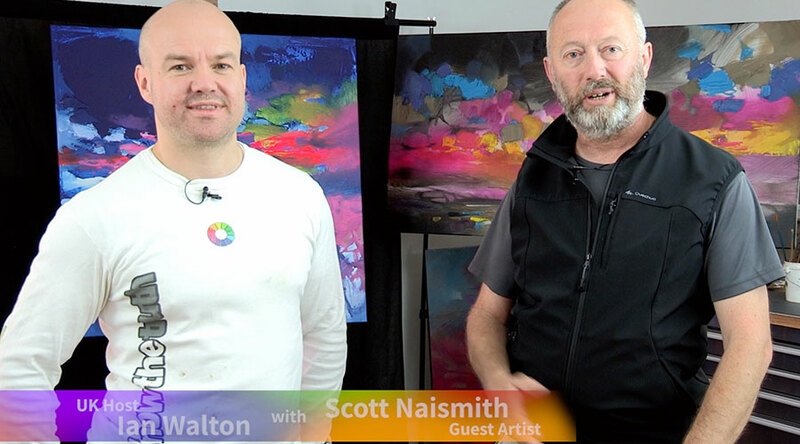 After a miraculous recovery from cancer by his father, recent marriage and birth of his 2 children, Scott Naismith draws upon a great positivity and energy.